Who Benefits from Mortgage Deductions? 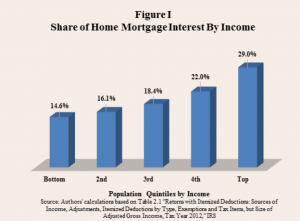 Deductions of home mortgage interest are a popular measure; supporters claim that it benefits low and middle income families, however, not all income groups benefit equally. Homeowners have access to three types of deductions: interest paid on a loan, points earned when finalizing a home purchase, and private mortgage insurance (for those who made a down payment for less than 20% of the home’s value). Pamela Villarreal, senior fellow at the NCPA, carried out a study to find who benefits from each type of deduction. – Mortgage interest: In 2012 about 66% of these deductions were claimed by the top 40% of households with incomes of $100,000 or more. Additionally the average deduction for the top quintile was $13,824 while the average for bottom quintile was $6,964. – Points deduction: Likewise, this deduction was claimed by higher earners. 27% of the value of those deductions, were claimed by those making more than $200,000 a year, and 60% of all claims for a points deduction were by taxpayers with incomes of $100,000 or more. – PMI deductions: This is the deduction that most benefits those with a lower income. Those in the bottom quintile receive 22% of the total value, higher than the 18 percent claimed by those in the top quintile. The study concluded that mortgage-related deductions tend to benefit more those home buyers who itemize, who are more likely to be middle and upper income earners. Other findings indicate that these types of deductions had no significant effect on the decision to buy a home, however, they influenced the size of the home purchased.